Most obnoxious fans in the NL East? Interesting how Shane Victorino answers that question. This graphic appears in ESPN The Magazine’s baseball preview package (an issue I’m just getting to now after finishing SI’s). As it explains, there’s one for each division asking players to answer only with cities within their divisions. 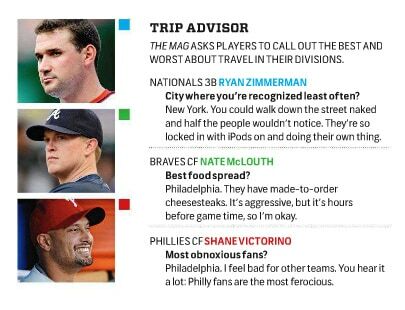 It’d be interesting to see what Victorino would’ve answered if he was asked about all NL cities, considering the beer shower he took in 2009. Also, as an outfielder, he’s closer to the cheap seats (at least the ones closest to the field vs. the upper deck) in whatever ballpark he visits, so I’m sure he hears it from the fans in every stop along the way. I think it’s funny how he says he “feels bad.” To me, using that phrase indicates how truly ruthless they can be.